As a token of its gratitude, the existing 100 Million plus Jio subscribers can avail the special Jio Prime Membership program which comes with several special benefits. First, Jio Prime Members will be able to enjoy the unlimited benefits of the existing Jio Happy New Offer for another full year or till 31 March 2018 for a nominal, one-time enrollment fee of just Rs. 99/- and a rock-bottom introductory price of only Rs. 303/- per month or effectively at just Rs. 10/- per day! Second, the program will enable Jio Prime Members to enjoy the full bouquet of Jio’s applications absolutely free till 31 March 2018. This translates to additional benefit worth over Rs. 10,000/- for the Jio Prime Members. In addition, there will be many other attractive deals and offers from both Jio and its partners that the Jio Prime Members will enjoy under this program. The Jio Prime Membership is available only for existing Jio customers and the enrollment window will remain open from 1–31 March, 2017. 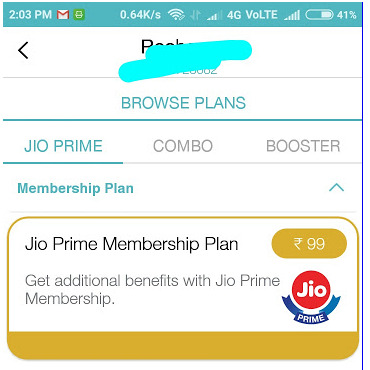 Enrolment for Jio Prime Membership can be done through MyJio app, the www.jio.com website or by simply walking into any Jio or Jio partner store. There 3 methods to get Reliance Jio Prime membership. - Download MyJio app from Play store on your phone. and open it. - Enter your Jio number and click submit. - Click on Jio Prime Membership. - Now click on pay Rs 99 for Prime subscription with Debit card, Credit card, Net banking etc. - Prime membership will be activated on your jio number. I love to use Jio network in India. Thanks for supporting!